The weather has definitely changed its pattern after the warm, dry, sunny May, June and early July. The rainforest has gotten too dry so rain is welcome from that standpoint, but it makes for a soggy experience for us and our visiting friends. Fortunately the misty clouds hanging on the mountains can be just as beautiful as sunny weather, and our friends have a great attitude about it all. Coming out of Peril Strait without experiencing any perils, we turned south towards Baranof Warm Springs. 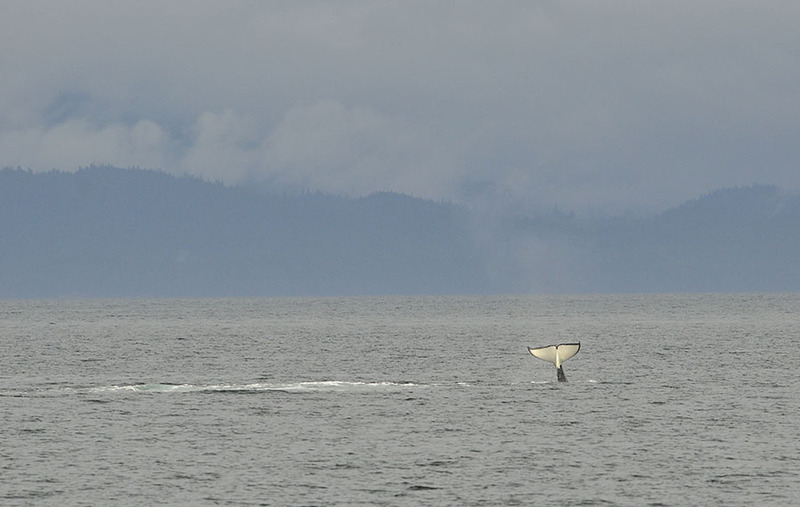 Along the way we spotted a tall dorsal fin – an orca! As we slowed the boat to watch we noticed a number of them all around us. 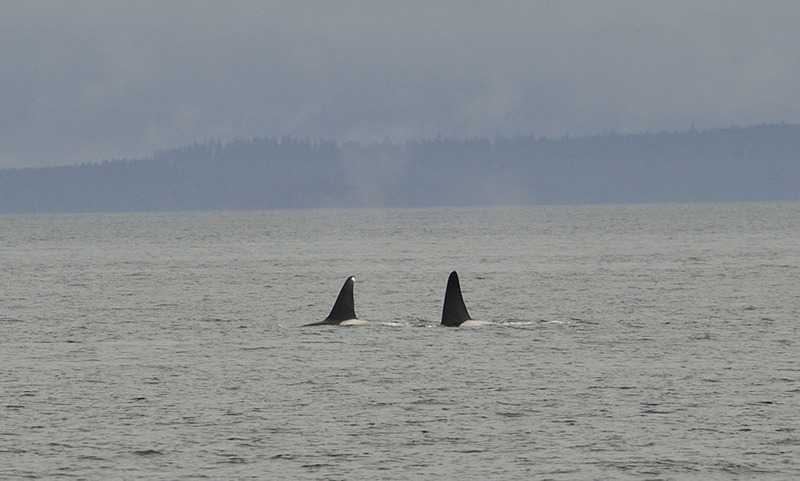 A pair of males with their tall dorsal fins were farther away, but we had a mother and two young orcas right in front of the boat, and others between us and the shore. The males started tail-slapping, making huge splashes… …and then one of them breached – a dramatic sight! 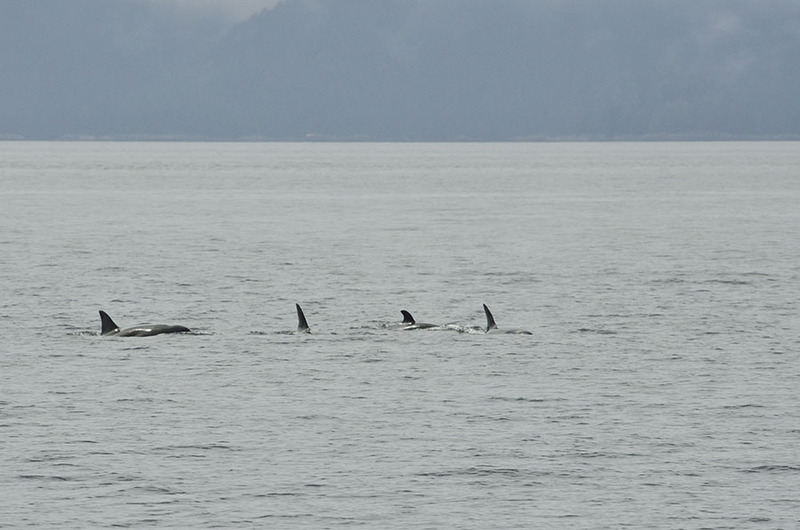 We just drifted with these orcas for about 30 minutes, and we were going crazy trying to figure out where to look – little orcas, groups of orcas, splashy, flashy orcas on all sides. 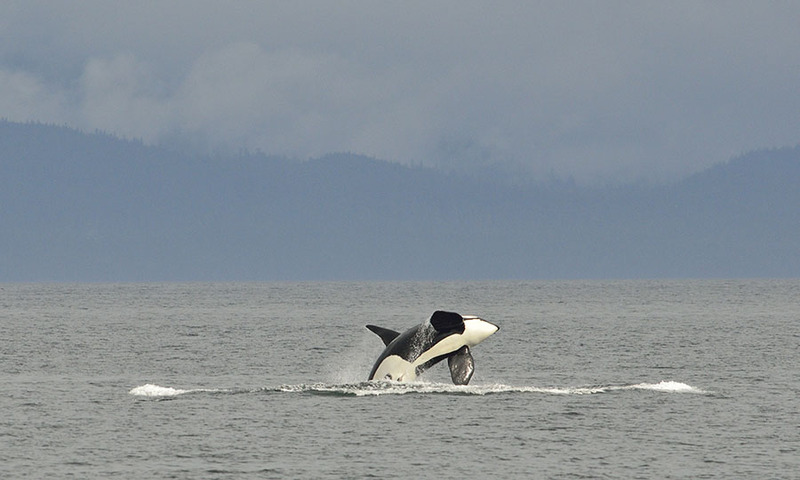 Eventually the orcas swam off, leaving us breathless. 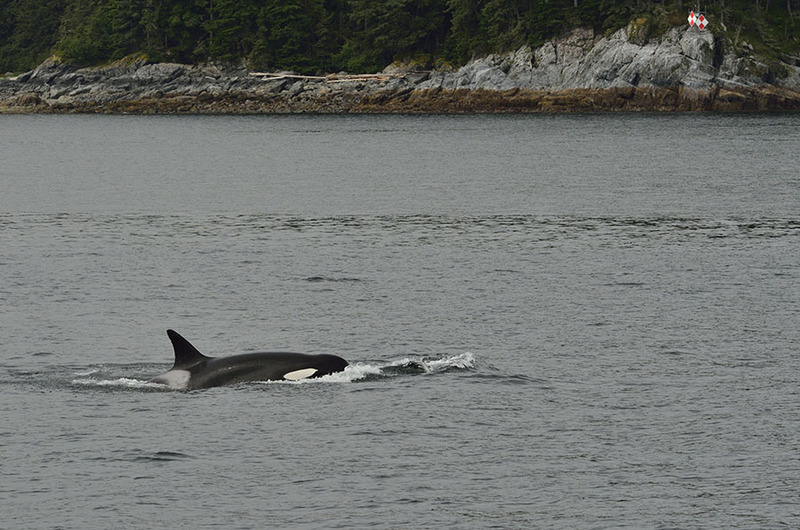 We’ve seen so many orcas this year, though they are usually a pretty rare sight in Southeast Alaska. We finally made it to Baranof Warm Springs, a tiny little boardwalk settlement on the east side of Baranof Island, on the opposite site of the island from Sitka, with 5000′ mountains in between. Warm Springs has a roaring waterfall and a natural hot spring, with a state dock and a little bathhouse where you can enjoy a private soak in a huge metal tub, plumbed to the hot spring, while gazing at the mountains and waterfall. 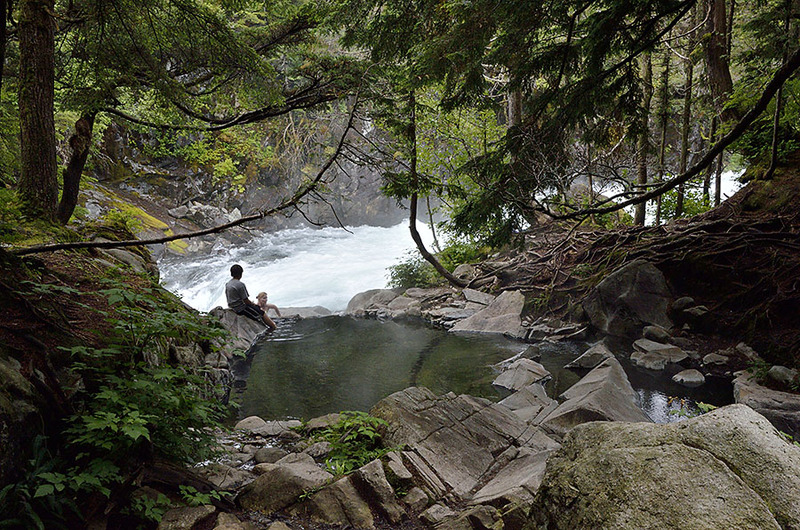 Alternately you can hike up to the natural hot pools in the woods which sit right next to the top of the waterfalls. We enjoyed a nice soak in the hot water and were happy to stretch our legs after two days underway. We met some nice Canadians from Victoria on the dock and invited them for cocktails, and we had a good laugh at and with them. Three people on a 32′ sailboat for weeks can make people a little starved for outside human contact, and they were so desperate to talk to (mostly at) us – it was funny, and we’ve been there ourselves so we understood. We had a foggy cruise from Warm Springs down to the beautiful Red Bluff Bay, with blue skies above and pea soup in front of us. 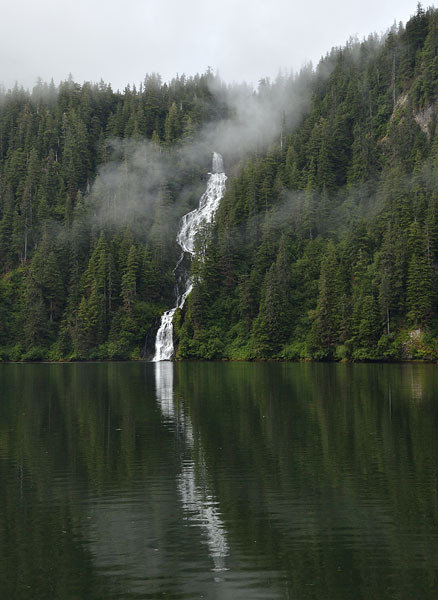 Luckily the fog lifted as we wiggled around the islands at the entrance to the bay, and we nosed ADVENTURES right up to the tall waterfall, always amazed that we can just about get the bow rail in the cascade while still in 150′ of water. The whole bay is so pretty – snow capped mountains, a steep bowl cut by tiny silver ribbons of water, and a broad green meadow. A month earlier we saw lots of brown bears eating grass in that meadow, but now berries are ripe so the bears are up in the woods gorging themselves on a much preferred food source. The salmon are late this year so the bears have to wait a couple of weeks for fish. High winds and waves out in Chatham Strait and Frederick Sound kept us an extra day in Red Bluff, but we were quite happy just to kayak and relax. 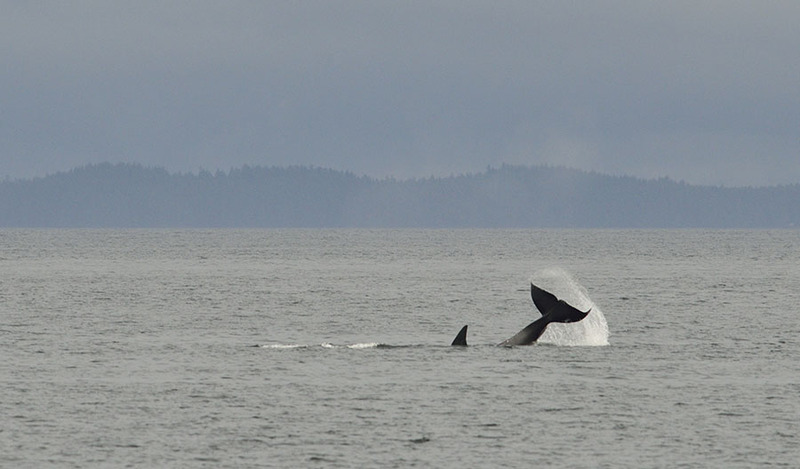 Sorry you’re experiencing some foggy/rainy weather but the orca pics are great! We’re finally leaving PT tmw, took a while to get Mom’s financial affairs in order & will meet Sidney friends in Ganges area. Will go up west side of San Juan Island hoping to find our local orca pod. Will be in Broughtons for our club cruise in 3 wks. In your blog you said 3 people on the boat! Who was the third person?